The all-cash offer of $125 per share represents a premium of 14 percent to Mellanox's closing price on Friday. Mellanox shares rose 8.2 percent to $118.35 and Nvidia shares gained 7 percent to $161.23 on Monday. "We want to double down on data centres," he said. Nvidia gets about a quarter of its revenue from data centres, with the $2.9 billion in sales in 2018 from the segment growing 52 percent year over year. The segment is important as a slowdown in China and a fading cryptocurrency craze have started to weigh on Nvidia's overall sales in recent quarters. 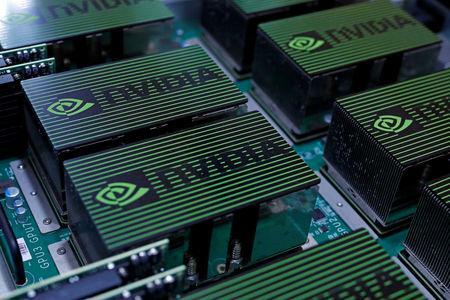 Nvidia said it believes that market for it and Mellanox is worth about $60 billion: $50 billion for Nvidia's computing chips and $11 billion for Mellanox's high-speed networking chips. "It's hard to not think Nvidia is just buying some revenue to help its case" in the data centre space, said Jason Carolan, chief innovation officer of Flexential, which operates data centres for big businesses and is a Nvidia customer. It's about market share in a segment they're already in, he said. Nvidia's DGX system is an artificial intelligence computer in a box, while Mellanox has a growing business selling complete switches, which could be combined with Nvidia's boxes, Wheeler said. Chinese regulators may require Nvidia to promise that Mellanox's technology will continue to work with chips from other makers, said Aaron Glick, a strategist with Cowen Inc.
"They're in the networking business, and networks are interoperable. We're going to keep it interoperable," Nvidia's CEO told Reuters in response to questions about regulatory approvals. "Both of our companies are focused on high performance computing, but neither of our companies have a giant position."